Since 1972, UNESCO has designated places they consider to be of outstanding value to humanity. Here are 14 of our favorites with suggestions of where to stay. See more hotels near UNESCO sites. Iguazu National Park was declared a UNESCO World Heritage Site in 1984 for its “outstanding universal value” – the park, spread between Brazil and Argentina, boasts more than 240,000 hectares of land, 2,000 species of plants, 400 species of birds and possibly as many as 80 mammals. The spectacular waterfall at the heart of the park is some 80 meters high and 2,700 meters in diameter, spanning the border between Argentina and Brazil and flowing into the Parana River below. Some of the more well-known species in the park include tapirs, giant anteaters, howler monkeys, ocelots, jaguars, and caimans. A UNESCO site since 1981, the Great Barrier Reef comprises over 2,500 individual reefs and 900 islands of varying shapes, sizes and ecosystems and is so large it is visible from space. It is a site of remarkable variety and beauty on the north-east coast of Australia, with 400 types of coral, 1,500 species of fish and 4,000 types of mollusc as well as 240 different kinds of bird and countless underwater sponges, anemones, and crustaceans. This otherworldly site is in danger due to coral death and bleaching from climate change, but countless volunteer and government agencies are coming together to save this amazing site. Voted “Europe’s Most Beautiful Square” in 2010, La Grand-Place has enjoyed UNESCO World Heritage status since 1998. Once a hodgepodge of homes and business in the city center, a proper square was first built here in the early 1400s. After near-total destruction by Louis XIV’s army in 1695, a rebuilding campaign was launched that saw the square become what is is today. With Brussel’s City Hall as the anchor point of the square, it is ringed on all sides by multiple Baroque-style guild halls as well as multiple examples of Gothic architecture. La Grand-Place has been the focal point of the city for centuries, and with UNESCO confirming its importance it will continue to be for many centuries to come. Lluís Domènech i Montaner was one of Spain’s finest architects in the early 1900s, and highly influential in the Catalan Art Nouveau movement. His two grandest structures, The Palau de la Música Catalana and the Hospital de Sant Pau, were granted UNESCO status in 1998. The Palau is typical of Catalan modernism, with curves instead of straight lines and an enormous interior full of light and space. The Hospital de Sant Pau is equally bold in its design and decoration, while at the same time perfectly adapted to the needs of the sick. Until 2009 it was Barcelona’s main hospital, but now is utilized as administrative space for the new hospital. Though it has only been an official city-state since 1929, Vatican City has been the focal point of Catholicism and one of the holiest sites in Christendom since the 1300s when the popes departed Avignon, France and started living in Italy full-time. A unique collection of artistic and architectural masterpieces lie within the boundaries of a tiny country. At its center is St Peter’s Basilica, with its double colonnade and a circular piazza in front and bordered by palaces and gardens. The basilica, erected over the tomb of St Peter the Apostle, is the largest religious building in the world, the fruit of the combined genius of Bramante, Raphael, Michelangelo, Bernini, and Maderno. It is also home to the Sistine Chapel, within the Apostolic Palace, and its world-famous ceiling frescoes painted by Michelangelo. A relatively new addition to UNESCO’s list in 2010, the canal ring is one of the world’s first (and best) models of large-scale urban planning. First imagined during the Dutch Golden Age of the late 1600s, the canals were devised as a way to expand the city to deal with the influx of new immigrants. By draining the swampland on which Amsterdam was built, new houses and buildings could be constructed while filling in the land with water instead of paved roads. It comprises a network of canals to the west and south of the historic old town and the medieval port that encircled it, and the success of this model inspired many other major European cities to follow suit by planning their expansions instead of just building out as needed. Sian Ka’an means “Origin of the Sky” in the Mayan language, and it is easy to see how it got its name once you are here. This biosphere reserve, declared a UNESCO site in 1987, provides a habitat for a remarkably rich flora and a fauna comprising more than 300 species of birds. In addition to the incredible bird population here, there are also iguanas, monkeys, jaguars and kinkajous known to make their homes in the reserve. If the boundless nature is too boring, there are also 23 known archaeological sites here including Muyil, one of the earliest and longest inhabited sites of the Maya. Although it was declared a UNESCO site in 1987, Venice was founded in the 5th century when Venetian residents would flee to one of the 118 small islands in the lagoon to evade capture by invaders. Eventually these islands became permanent settlements, and by the 10th-century Venice was a major maritime power and a bridge between the Christian kingdoms of the East and Muslim kingdoms of the West. As its power on the seas began to decline, its importance as a cultural center grew astronomically. The whole city is an extraordinary architectural masterpiece in which even the smallest building contains works by some of the world’s greatest artists such as Giorgione, Titian, Tintoretto, and Veronese. Yet another UNESCO site threatened by climate change, the famous “acqua alta” tides are growing ever higher as sea levels rise and Venetians are tasked with finding ways to adapt and protect their city. Valletta’s global importance came after the 1565 Siege of Malta, though it took until 1980 for it to be declared a UNESCO site. After a group of just 2,400 Knights Hospitaller and Maltese citizens were able to repel the forces of the Ottoman Empire over a 4 month siege, Europeans realized that the Ottomans were not as infallible as previously thought. The capital of Malta was ruled successively by the Phoenicians, Greeks, Carthaginians, Romans, Byzantines, Arabs, and the Order of the Knights of St. John. Valletta’s 320 monuments, all within an area of less than a square mile, make it one of the most concentrated historic areas in the world. It is also unique in that much of its 16th-century urban planning has remained untouched in subsequent centuries, forcing the modern city to grow around the footprint of the past. It is almost impossible to overstate the importance of Athens, especially the Acropolis, with regards to its impact on the world. A UNESCO site since 1987, The Acropolis of Athens and its monuments are universal symbols of the classical spirit and civilization for which Ancient Greece is known and have watched over the city from atop a hill for over 3,300 years. They form the greatest architectural and artistic complex bequeathed by Greek Antiquity to the world, and were the birthplace of democracy, freedom of speech and expression, and even the concept of philosophy. Without the ideas born out of the Acropolis, the modern world would look very different than it does today. Each terrace, canal, dam, pyramid and artificial mound discovered at this site was literally carved out of the mountain upon which they sit. A UNESCO site since 1987, Monte Albán was continuously inhabited over a period of 1,500 years by a succession of cultures – Olmecs, Zapotecs, and Mixtecs. The design of the site and the buildings found there suggest it was designed with a sacred topography in mind and used as a civic and religious center by the native peoples. The nearby city of Oaxaca, which is built on a grid pattern and is also a UNESCO site, is a perfect example of 16th century Spanish colonial town planning. 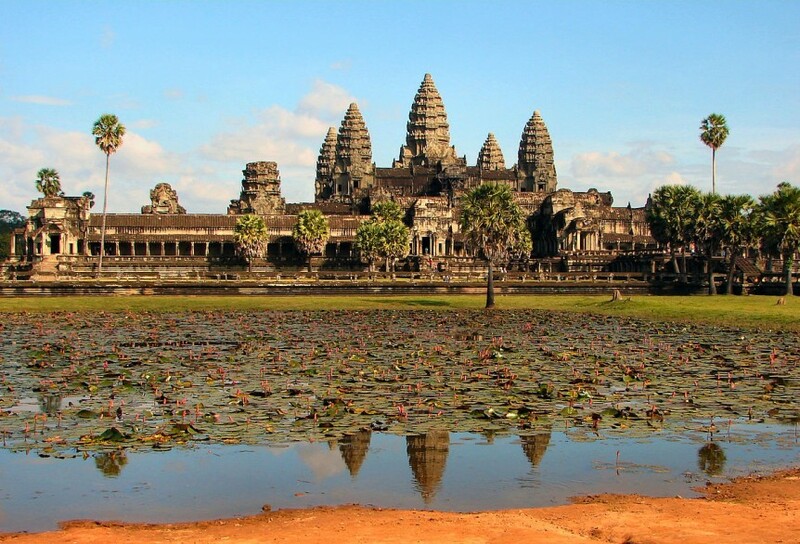 Angkor Archaeological Park is home to the remains of the various capitals of the Khmer Empire which ruled the region from the 9th through the 15th centuries when it was thought to be abandoned due to climate change or the spreading plague impacting the entire continent. Stretching over 400 square kilometers, including the lush forests surrounding the buildings, there are remnants of temples, communication routes, and even reservoirs and canals that were used to support the population as well as the rice paddies that sustained them. Added as a UNESCO site in 1992, some of the more famous sites in Angkor Archaelogical Park are the world-famous temple complex of Angkor Wat and the Bayon temple at Angkor Thom with its bas-relief carvings. Chaco Canyon is home to the densest concentration of Native American pueblos in the entirety of the American Southwest. In 1987 it was added to the list of UNESCO sites, but Chaco Canyon was continuously inhabited for over 2,000 years with most of the construction occurring between the years 850 and 1250. It was a focus for ceremonial, trade, and political activity for the prehistoric Four Corners area until it was abandoned, again most likely due to climate change through an unprecedented 50 year drought in the area. Chaco is remarkable for its monumental public and ceremonial buildings and its distinctive architecture – it has an ancient urban ceremonial center, the 650-room Pueblo Bonito, that is unlike anything constructed before or since. This proposed UNESCO site consists of nine primarily commercial buildings in Chicago’s “Loop” district. The buildings, built over a period of about 20 years starting in the 1880s after the end of the Depression of 1873-1879, exemplify the first generation of skyscrapers. After the Great Chicago Fire in 1871, there was a tremendous opportunity to rebuild the entirety of Chicago’s downtown area since a majority of the buildings there were made of wood and did not survive the blaze. Making use of new technologies of the time, they were able to rise to heights of near 20 stories with large plate-glass windows, the first elevators to reach the high floors, and electric lights to make interior spaces usable.